The Cavaliers return home from a quick weekend back-to-back and close out the unofficial first half of the season with a pair of Big Apple opponents at The Q – beginning with Monday night’s matchup against the Knicks. The Cavaliers have had a frustrating season and come into tonight’s contest having dropped four straight – including Saturday night’s defeat in Indiana – falling behind by double-digits in the first quarter and barely making a dent from there, dropping the season series to the Pacers. The Knicks – one-half game behind the Wine & Gold for the worst mark in the East – are in danger of putting up a historic losing streak, having dropped 16 straight coming into tonight’s contest. On Saturday night at the Garden, the Knicks gave Toronto all it could handle before succumbing late for their 45th loss of the season. The Cavs have met up with the Knicks once this season – topping them by a touchdown at The Q in early December – and have one more date against them on the final day of this month. In Cleveland’s December 12 victory, Jordan Clarkson led all scorers with 28 points and Matthew Dellavedova scored 15 of his own in his return to the Wine & Gold. On January 30, Dennis Smith Jr. – as a member of the Mavericks – had probably his best all-around game of the season, dropping a 13-point, 15-assist, 10-rebound triple-double on the Knicks. Two games later, he was a New York Knick, having been sent to New York in the blockbuster Kristaps Porzingis trade. Many New Yorkers felt that their squad should have tabbed Smith when they had the chance in the 2017 Draft, so everything worked out in that respect. The former NC State star got off to a slow start but has been very good for David Fizdale’s squad ever since – including a 31-point, eight-assist effort against Detroit two games ago. Over his last three games, Smith has averaged 23.0 points and 6.7 boards per. On Monday, he’ll be going up against another young point guard who has no trouble scoring the basketball in Collin Sexton. On Saturday night in Indy – after dropping 27 points in back-to-back contests – the Young Bull tallied 16 points, going 6-of-14 from the floor, including a perfect 3-of-3 from beyond the arc to go with five boards and four assists. The former Alabama star comes into tonight’s contest tied with Luka Doncic with 48 double-figure scoring performances, is top among rookie free throwers (.856) and is the second-ranked long-distance marksman at an even 40 percent from deep. 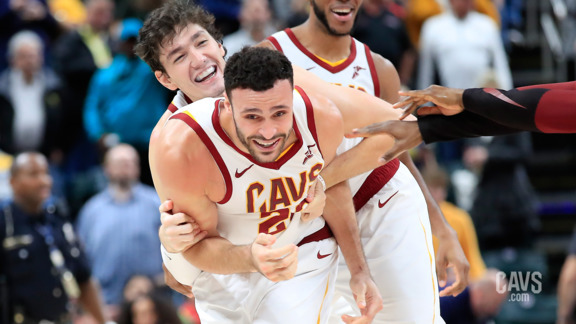 With everything swirling around the Wine & Gold, Larry Nance Jr. has simply been the model of consistency since returning from an MCL sprain seven games ago. But calling Nance “consistent” doesn’t cover his all-around excellence over the past five games, doubling-up in each contest for the longest stretch of his young career. On Saturday night in Indiana, one night after grabbing a career-high 19 boards against the Wizards, the 27th overall pick of the 2015 Draft netted his 11th double-double of the season, finishing with 16 points on 6-of-11 shooting, including 3-of-5 from long-range, to go with a team-high 10 boards and a pair of blocked shots. Over that five-game stretch, Nance is averaging 12.2 points and 12.8 rebounds per, shooting an even 50 percent from the floor (24-of-48) and from beyond the arc (5-10) over that span. With Coach Larry Drew mixing and matching his frontline basically all season, it’s hard to know whether Nance will start or not – especially with Kevin Love returning to the rotation over the weekend. Either way, both players will get a look at impressive Knicks rookie, Kevin Knox. The 19-year-old former Kentucky standout has scored at least 20 points on eight occasions this season and went for 31 against the Sixers in mid-January. He went for 19 points and seven boards in his first career meeting against Cleveland and could be another handful tonight. Monday morning after the Trade Deadline is usually a good time to check out how the new acquisitions did in their debuts. The Cavaliers shook up the roster last week – dealing Rodney Hood on Super Bowl Sunday and trading his former Jazz teammate, Alec Burks, four days later. When the smoke cleared, the Wine & Gold wound up with Marquese Chriss, Brandon Knight, another nice haul of draft picks and – after being released by the Pacers – young veteran shooting guard Nik Stauskas, who could see action as early as tonight. The 21-year-old Chriss was impressive in his debut on Friday night in Washington – finishing with a season-high 13 points to go with eight boards, which was good enough to get the start the following night in Indy. And while Chriss slowed down a bit in that contest, Brandon Knight made a stellar debut – canning all three triples he attempted, finishing with nine points in just under 12 minutes of work after not having played a minute in almost a month. Stauskas played in 44 games with the Blazers this year, averaging 6.1 points per while netting double-figures on eight occasions, including a 24-point effort in Portland’s opener against the Lakers. 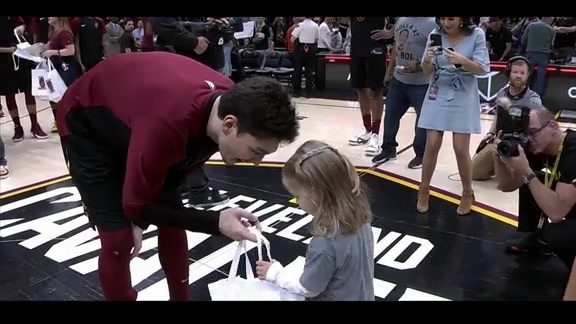 With Love returning to health – and Tristan Thompson and Cedi Osman hopefully just around the corner – the Cavaliers can actually enjoy a bit of depth after battling the injury bug all season long. This is good news for a bench that’s already been one of the NBA’s best. The catalyst for Cleveland’s second unit all season long has been Jordan Clarkson, who led the squad in scoring for the 24th time this year on Saturday night – finishing with 18 points and a team-high six assists, going 8-of-16 from the floor in 31 minutes of work. Despite Clarkson being the only sub in double-figures, Cleveland’s bench still combined for 43 points as a unit. Clarkson can get some much-needed wing relief if Brandon Knight -- perfect from long-range in his Cavs debut -- and Nik Stauskas are able to contribute. Ante Zizic hasn’t flourished off the bench this season and that’s been the case since being removed from the starting lineup, averaging just 4.5 points and 2.0 boards in relief after a solid stint with the opening five. Rookie center Mitchell Robinson has been the Knicks' top bench scorer of late – having notched double-figures in three straight games off the bench for New York, including a 13-point, 10-rebound double-double last week in a loss to the Pistons.